The Trixie Memory Trainer for Dogs is a great way to train your dog, as well as providing physical exercise. 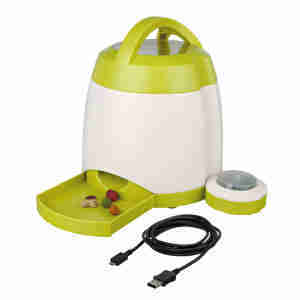 To engage your dog, fill the dispenser with treats and place the button up to 40m away. With the help of the included guide, you can teach your dog that pressing the button with their paw will release a treat from the container! The versatile toy comes with a micro USB that can be plugged into the mains. If you prefer to use the toy outside, it can be powered with batteries too (not included). Measures 20 (diameter) x 24 (h) cm. 7 month Boston Terrier, picked it up quickly and uses it frequently. Keeps him entertained. Bought this to entertain my lab with her breakfast or dinner if she has a few hours by herself before I finish work. It really makes her think and she gets so excited when it comes out the cupboard. You can see the stimulation it gives her. Fantastic item. Bought this to use as a training aid teaching my dog to use agility equipment to keep her forward focused when completing weaves and contact equipment. Works really well as I can use this on my own as the remote control delivers the treats as and when I need them to without her looking back at me or turning to me for her reward.